Air Tahiti Nui is currently replacing its Airbus fleet with what we believe to be the best aircraft flying the skies, Boeing 787-9 and made it uniquely Tahitian for more relaxing and immersive travel experience. 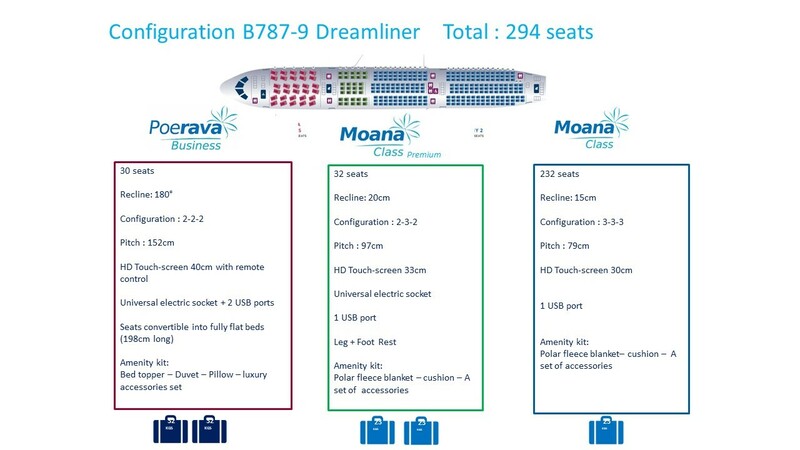 The four new aircrafts are named after our famous islands Fakarava, Bora Bora, Tupaia and Tetiaroa. The Tahitian Dreamliner windows are the largest than of any jet and are higher positioned for an open cabin feel so every guest can see out to the horizon. Equipped with the latest generation of technology our new aircrafts sail smoothly, more quietly delivering significantly more comfortable cabin atmosphere for our customers: purified air, adjusted humidity and LED lighting. At a touch of a button windows can be dimmed or an infinite combination of mood scenes created. Air Tahiti Nui’s guests wake up in Gaugin’s colour palette of mauve and pink and dine in a never-ending sunset, a true Tahitian Bliss. Our customers can now choose to travel in one of our three cabins designed to optimise space and enable restful travel. At 35,000 feet guests are cared for by proud cabin crew who will change from formal into more resort-style wear to deliver the warmest Tahitian hospitality. Our inflight menu offers delicious meals with Polynesian and French influences and can be paired with wines from France and the New World. As an all-inclusive airline our customers can enjoy onboard all amenities without hassle. - Seats can be requested free of charge or “extra comfort” or “preferred seating” can be reserved at a cost. - “Priority Pass” and “Lounge Pass” can be purchased for a more comfortable experience during the time spent at the airport. - For special occasions “Delices and Champagne” are also available; and when needed “Extra baggage” can be booked via Air Tahiti Nui’s website. An immersive experience for your customers on board our Tahitian Dreamliner is ensured by Panasonic’s most advanced in-seat inflight entertainment system with multi-touch screens allowing audio-video on demand. High speed internet is also available via satellite broadband and WiFi for maximum connectivity of our guests.